What is the Real Cost of a Little Water Leak? 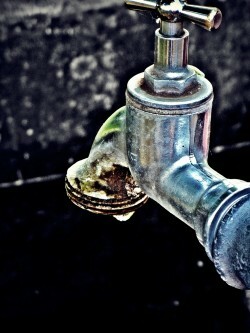 1-800-Plumbing > Blog > Plumbing Tips > What is the Real Cost of a Little Water Leak? When it comes to the plumbing system in your home, you might not think that a small water leak is a big deal and figure that you’ll “get around to” fixing it at some point. However, any leak, no matter how small it may seem, if left untreated can cause major damage and the repair costs can be significant. There are many variables at play to determine how much a leak is costing you on your water bill every month so there is no “one size fits all” answer, but the losses can be significant. The Town of Williamsburg, MA compiled a helpful chart that outlines how a small leak can develop into a large cost, demonstrating the water and sewer costs per day based on the size of the leak. In their example, a quarter inch leak wastes 14,952 gallons of water per day at a cost of $134.57! According to Water.org, 1 in 10 people in the world lack access to safe water, which makes it a real shame that the EPA estimates that the average household’s leaks can account for more than 10,000 gallons of water wasted every year, or the amount of water needed to wash 270 loads of laundry. A household leak can cause damage to walls and floors such as rotted wood. When the walls and floors have wet spots, the moisture can lead to mold which requires the services of a mold remediation company to remove the mold and contractors to remove and replace the walls or floors. This can all be extremely expensive. Since even a “little” water leak can have big consequences, homeowners must be vigilant and fix leaks as soon as they are spotted. Some leaks are noticeable but others are hidden, which requires some investigation. The quickest way to determine if there is a hidden leak somewhere is to check your water meter, avoid using water for at least a few hours, and then check it again. If the meter reading isn’t the same, there is probably a leak somewhere. Homeowners should be on the lookout for a musty smell, loose tiles in the kitchen or bathroom, and discolored floorboards, which can all be signs of a leak. The most common household leak is the toilet. To check if there’s a toilet leak, put food dye into the toilet tank and wait 20 minutes. If the food coloring appears in the bowl, there is a leak. Homeowners should fix leaks as soon as they find them, or if the job is complex, hire a trusted plumber to fix it. If you have a preventative maintenance plan with a plumber (which is recommended) the service may be included at no additional cost.